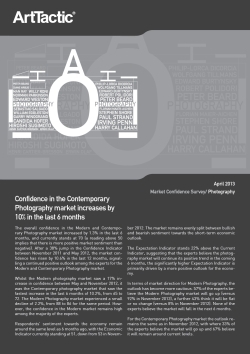 Photography Market 2013 Confidence Survey | Confidence in the Contemporary Photography market increases by 10% in the last 6 months. The overall confidence in the Modern and Contemporary Photography market 2013 increased by 1.3% in the last 6 months. Currently it stands at 70 (a reading above 50 implies that there is more positive market sentiment than negative). After a 38% jump in the Confidence Indicator between November 2011 and May 2012, the market confidence has risen by 10.6% in the last 12 months. This signals a continued positive outlook among the experts for the Modern and Contemporary Photography market.